Everyone should be totally adjusted to back-to-school days and it’s totally time for a slice of sour cream coffee cake with apples. Yes! You all deserve a coffee break and a generous slice of this delightful cake! Why is a coffee cake called a coffee cake? I’ve been asked that by some Italian friends and even a relative or two, when it doesn’t have to necessarily have coffee in it. 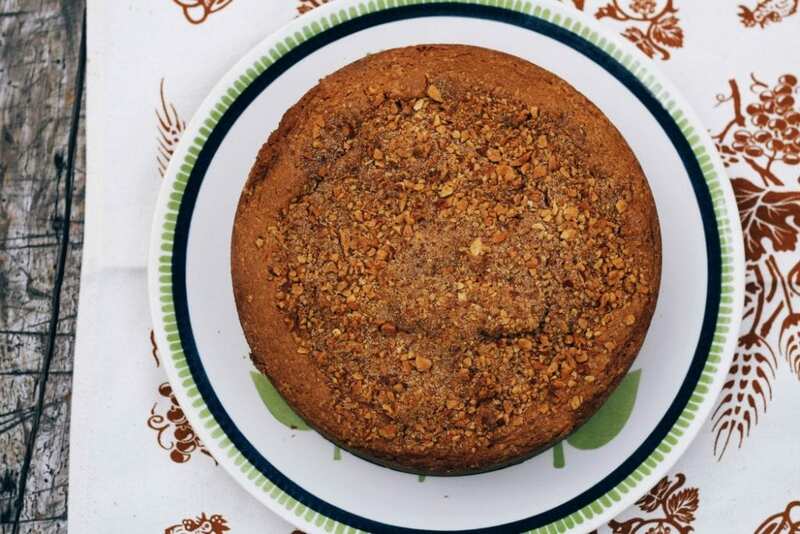 A coffee cake is a cake to enjoy with your friends (or family)with a cup of your favorite coffee. I love to make coffee cakes when we are in Italy for my in-laws, especially of my sister-in-laws. She has such a sweet tooth and as soon as we arrive in Italy, she is so excited to see what is new and different that I’ll bake for them. And let me tell you, it’s not easy getting into my mother-in-law’s kitchen to bake something. It’s sort of a challenge at first to convince her we will be baking something without her help. Then once she’s convinced, it’s the matter of gathering the ingredients. Sometimes she’s out of butter or eggs and she sends one of the grandkids down to the local shop to get what I need. Sometimes the flour is out and she sends my father-in-law down to the cantina to get a bag. Sometimes the mixer is being used by her for something she’s making and I have to wait my turn. I’m telling you, I have often lost my desire by the time we get every thing lined up to make the dessert. Or we have every thing ready to go, but we have to to the store to get something for later for dinner. It’s always an adventure and once in a while, we do get baking!! 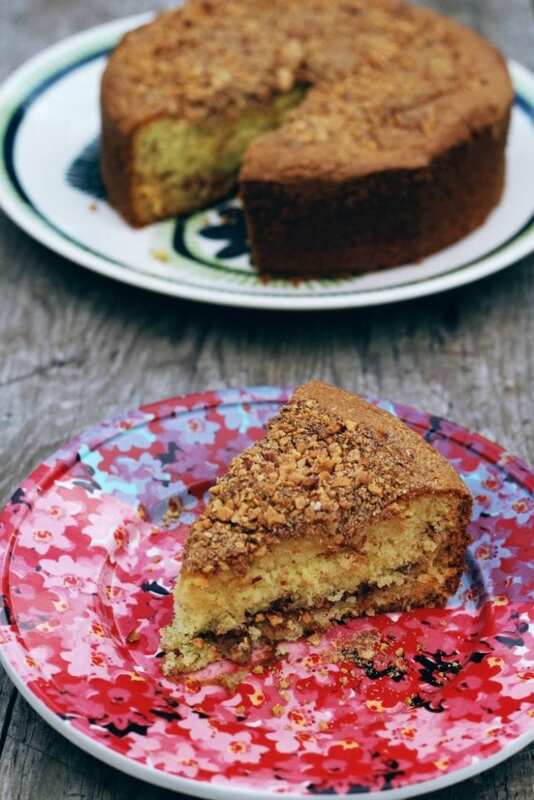 Coffee cakes are usually made with baking powder (not typically risen with yeast, unless it’s this fantastic apple cake) and they usually have a crumble topping that includes cinnamon. They can be square, rectangular or round and filled with fruit, chocolate chips or even the same crumble used to top the cake. 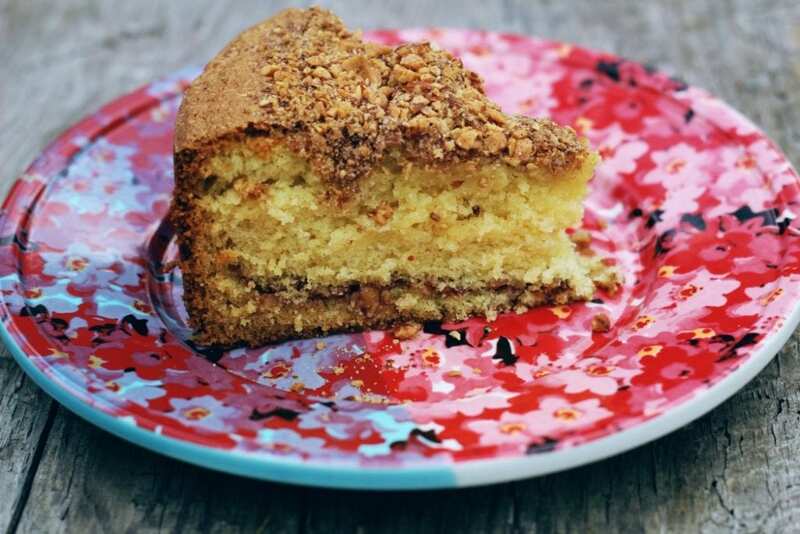 So the most typical characteristic of a coffee cake is the fantastic crumble topping. The cake is usually very moist from the addition of buttermilk or sour cream. And if you are baking one of these cakes while in Italy, it may be difficult to find sour cream. You could use 1/2 fresh cream and 1/2 low-fat natural yogurt mixed together to make your own sour cream. Make your coffee cake featuring seasonal fruit (like now, how about some fabulous end of summer peaches or plums), apples, pears, chocolate, apricots, lemon, and even a little caramel! HOW TO MAKE SOUR CREAM? 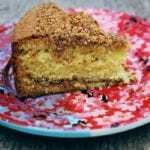 This coffee cake is adapted slightly from this overnight coffee cake that we make for Christmas morning every year!! A fluffy and moist coffee cake with a surprise layer of apples and a crunchy almond cinnamon sugar topping. Preheat oven to 350°F. Butter a springform pan and line the bottom with a circle of parchment paper. In a medium bowl, sift together the flour, salt, baking powder and baking soda. Mix together in a small bowl 1 teaspoon cinnamon and 1 Tablespoon sugar (you could use less sugar), set aside. Mix together in another small bowl the almonds, 1 teaspoon cinnamon, and 1 tablespoon of the sugar in a bowl and set aside. Beat butter and 1 cup sugar at medium speed with an electric mixer until light and fluffy. Add eggs, 1 at a time, beating just until blended after each addition. Beat in the vanilla. Add flour mixture to butter mixture alternately with sour cream, beginning and ending with flour mixture. Beat at low speed just until blended after each addition. Pour 1/2 of batter into pan. Smooth out with a rubber spatula. Layer on the sliced apples in a concentric circle making sure the apples don’t touch the edge of the pan and toss on the first cinnamon sugar mixture. Spread remaining batter on top and smooth out with a rubber spatula; sprinkle with remaining cinnamon sugar and almonds. Bake until a skewer inserted in center comes out clean, 40 to 45 minutes. Let cool on a wire rack 15 minutes. Invert onto wire rack; let cool completely. This looks so delicious! I have a baking apple in need of a recipe, and I think this is on my agenda today! I love sour cream cakes! The apples really make this! Looks delicious! I can see myself sitting on my back porch wrapped in a blanket drinking my coffee while enjoying this! Hurray for apple season! This cake looks perfect! And this is a great looking cake! Love that you added a sour cream sub. Sour cream in cakes is just divine! Pinning. this is a wonderful fall dessert! This cake is an absolute beauty! I can imagine there's no better way to spend an afternoon than with a slice of this and a cup of coffee. Thanks for sharing that sour cream trick too, I'm going to remember that! These look so moist. Perfect for apple season! 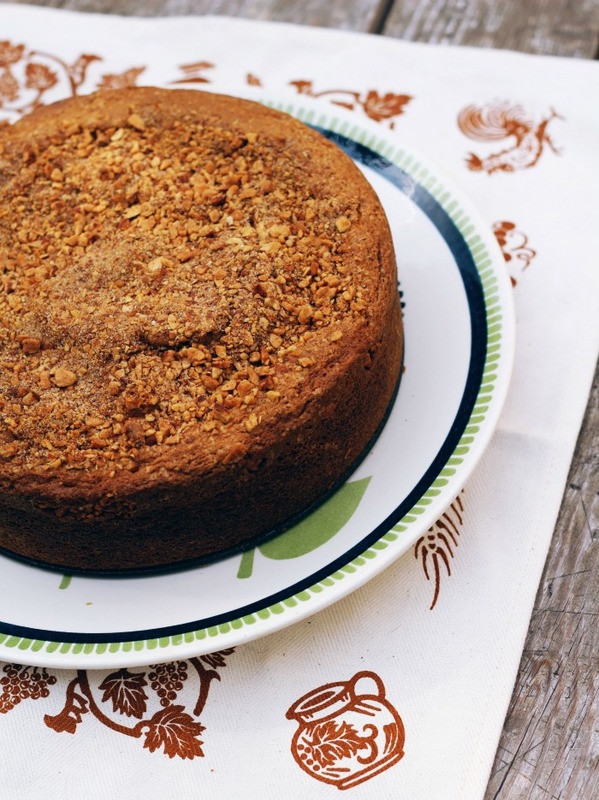 Coffee cakes are the best, especially when they have an amazing streusel/crumble layer on top. This sounds like one I need to try! This is one seriously perfect fall cake! 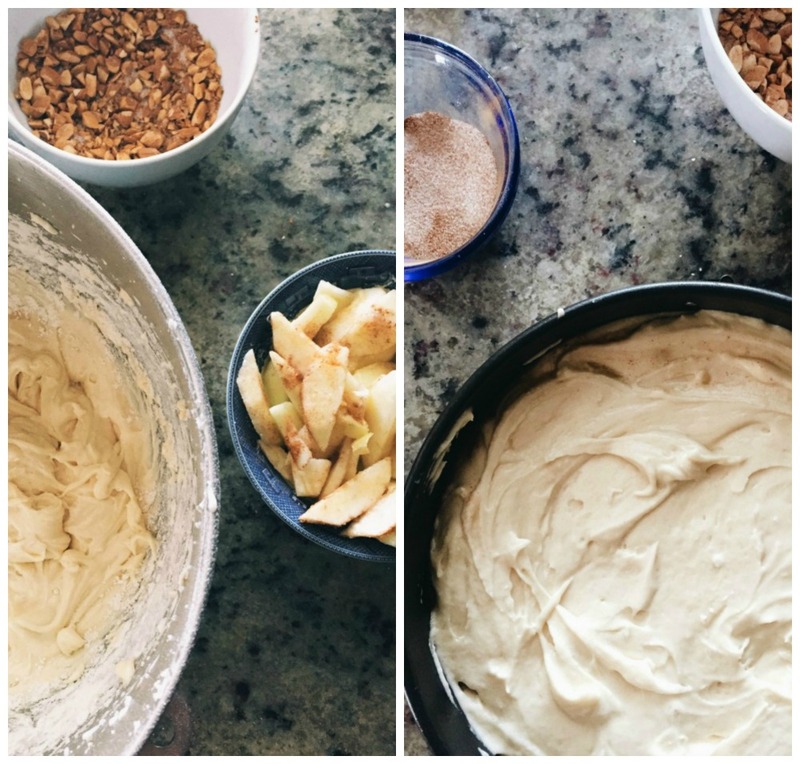 Coffee cake with apples, yes PLEASE!